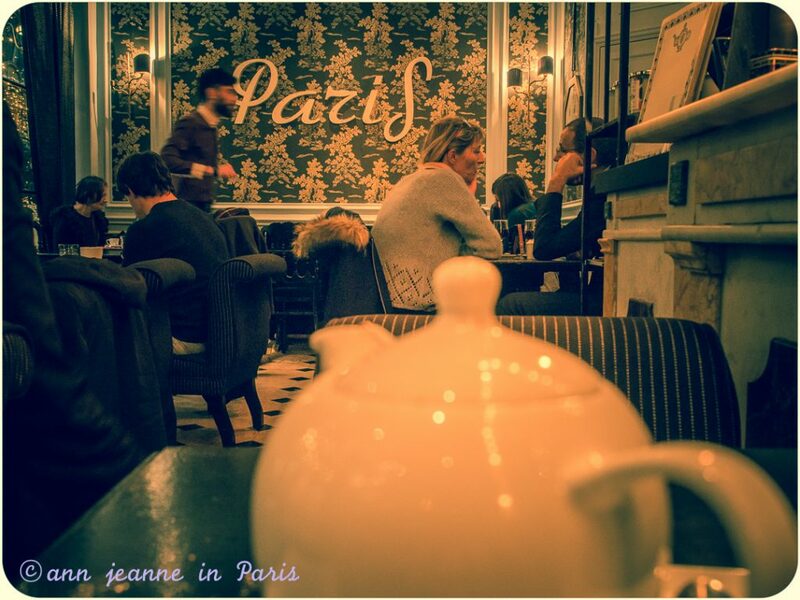 Allow yourself to be transported into this old fashioned luxury atmosphere. 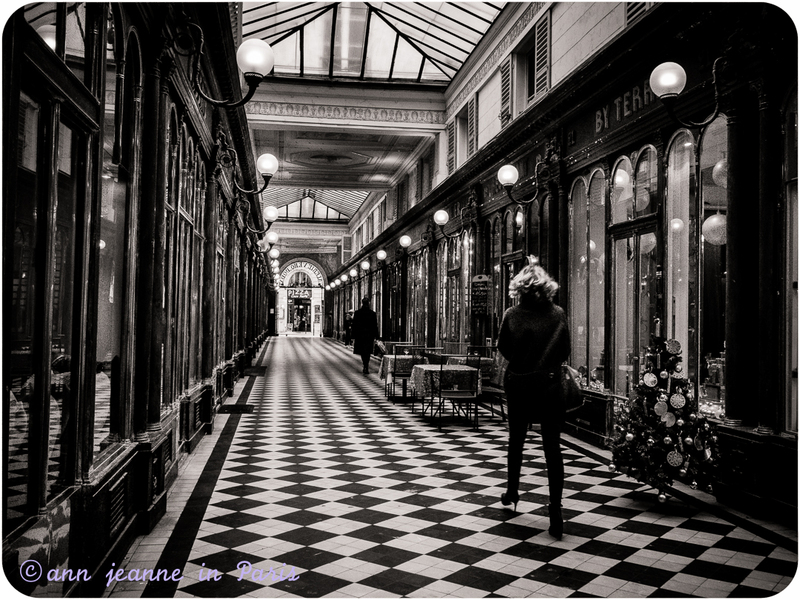 The atmospheric 19th century private walking tour with Ann Jeanne in Paris, will make you step into another world. 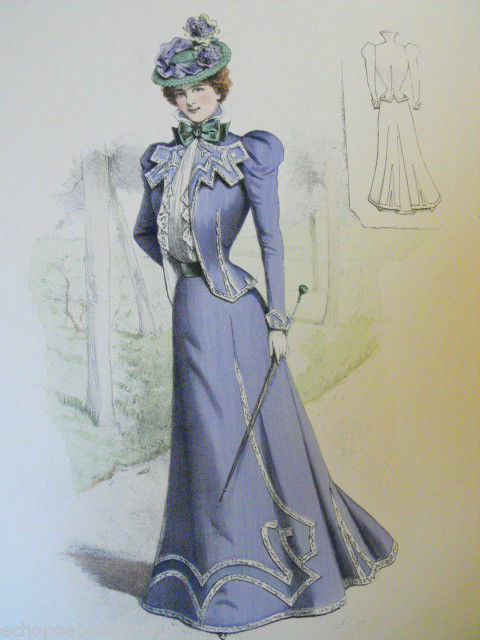 It will draws you in, as if you were living in the 19th century ! A tour full of the charm of an old world, and a refined atmosphere.. 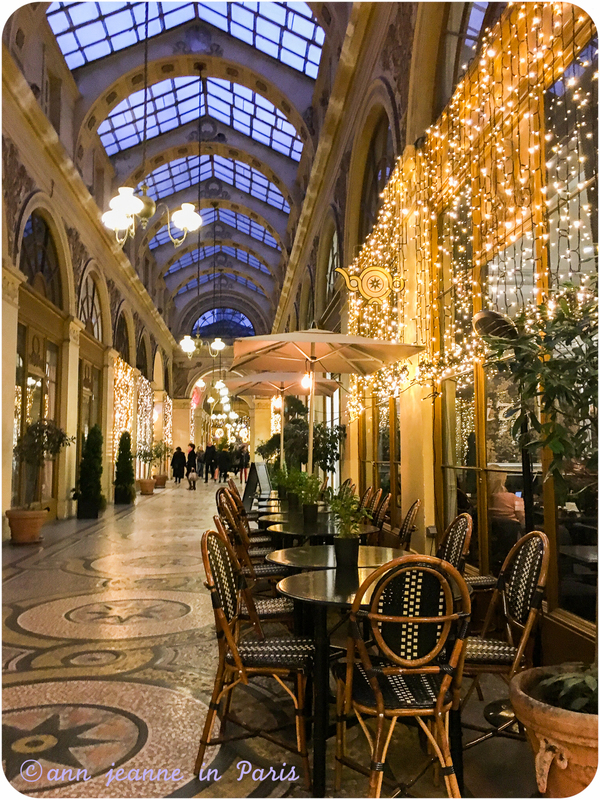 Along the way : 5 or more covered passages, the Palais Royal, wonderful tearooms and traditional old shops, Marie-Antoinette’s favorite chocolates (though it dates back to the 18th century ! 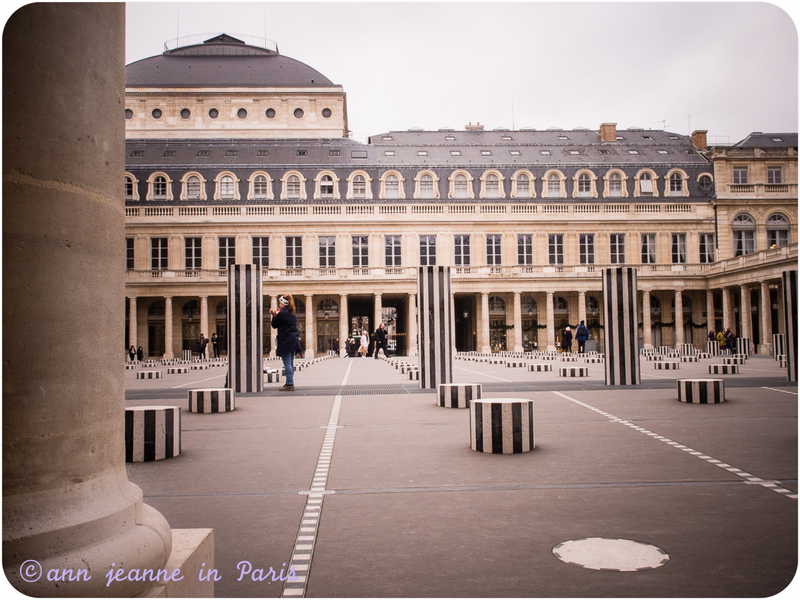 ), Haussmanian buildings, old theaters and many more. 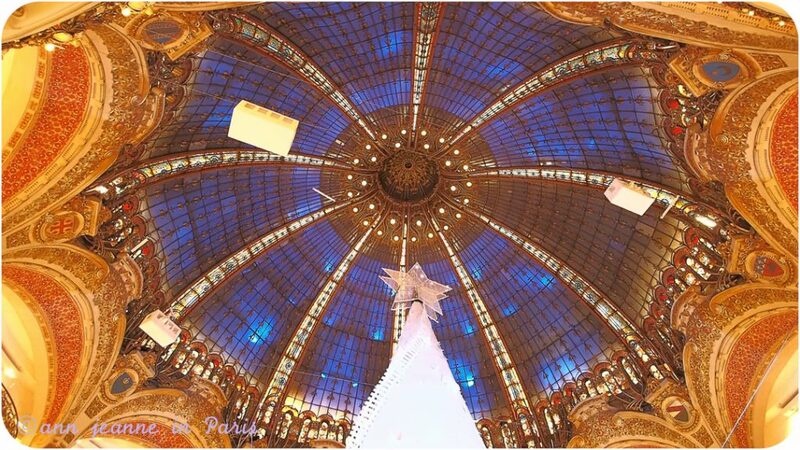 During the whole day tour : you’ll see the Galeries Lafayette dome and many more 19th century gems. 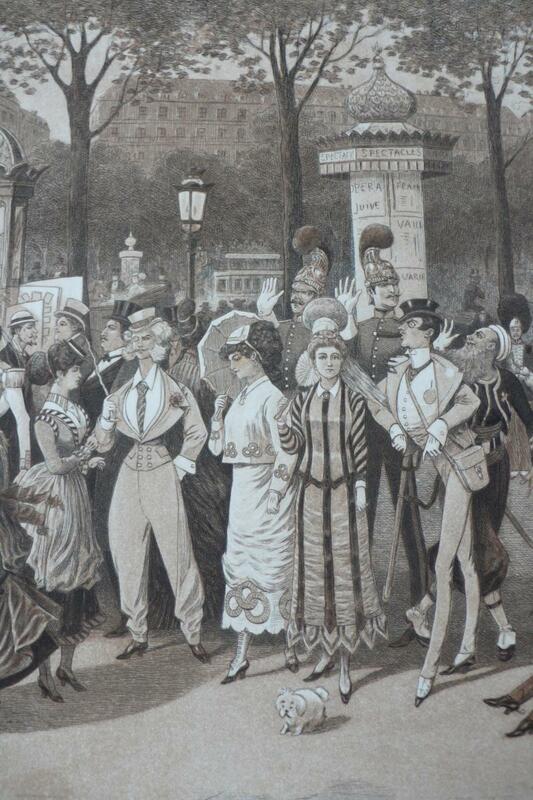 The 19th century is everywhere in Paris. 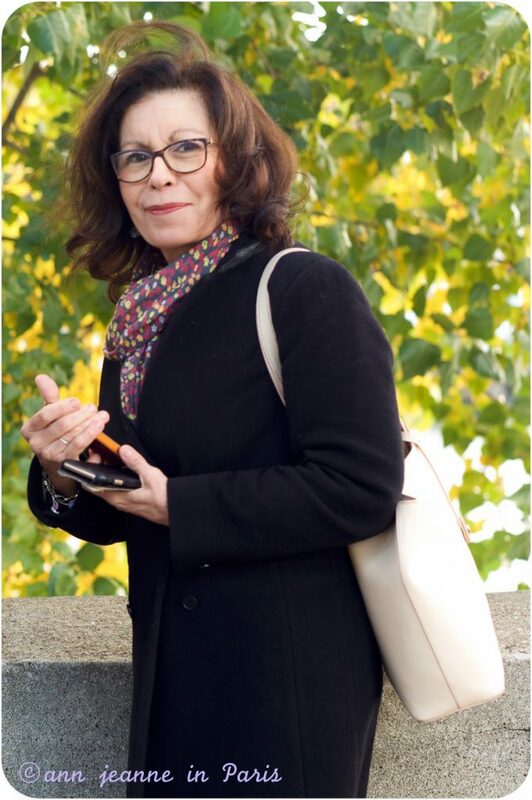 It was a fascinating time in the capital city of France. During this 19th century tour, you’ll really feel the 19th century atmosphere. Among other shops, we’ll see an amazing shop with very old walking canes. 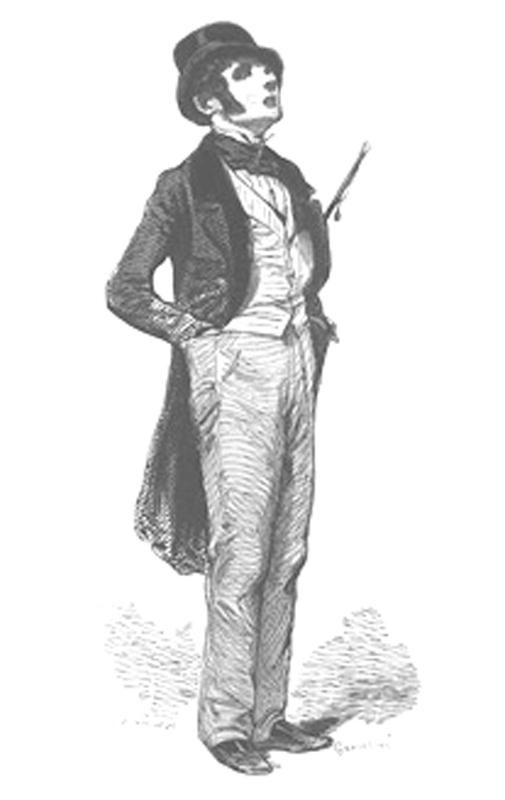 Gradually, men adopted long trousers rather than knee breeches, the tall hat developed into the top hat, the hair was often worn short and curled and the coats still finished in long tails at the back. 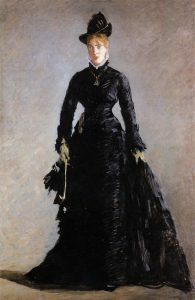 The women’s dresses gradually revealed the form of the body. The covered passages are real architectural gems which have not really changed since the mid 19th century. 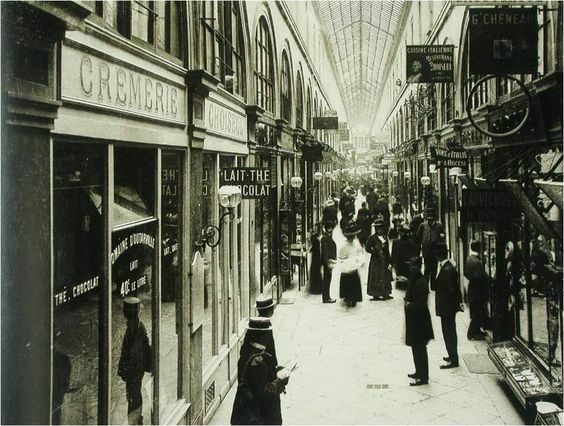 And you will stroll in some of the 15 Paris’ covered passages left (there were 60 or so “passages couverts” in the 19th century) and will be able to go shopping exactly the way Parisians have done during the 19th century ! The haunts of the flaneurs ! 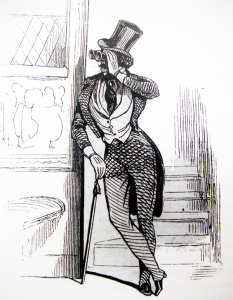 During the 19th century, the wealthy class were attracted to the passages by their elegance and their intimacy. 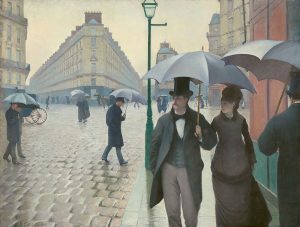 They were built to protect the Parisians from the rain and the mud of the streets and the traffic (the streets were still unpaved, dirty and dangerous because of the traffic). They were also used as short cuts between blocks. 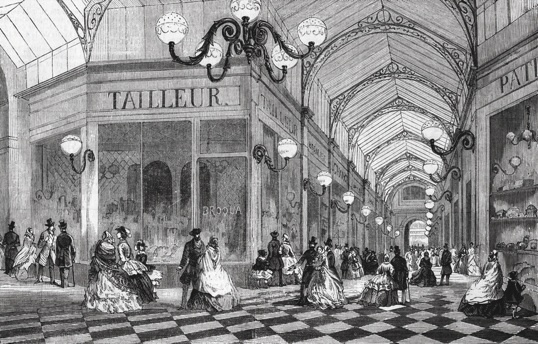 At the end of the 19th century, they were gradually overshadowed by the new Grands Magasins (department stores) and somehow, left behind. 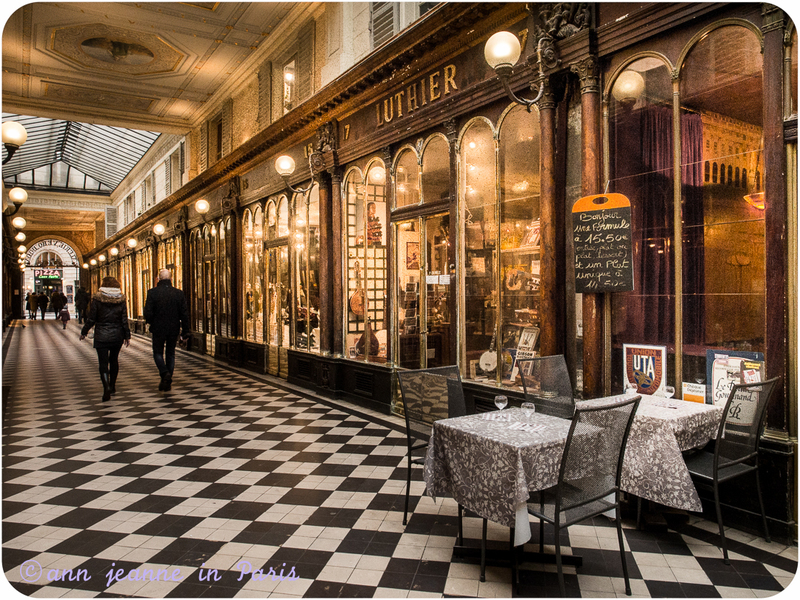 Renovated mainly in the late 20th century, now, they’re again great places to walk and browse the boutiques, being protected from the rain and get a feel of the 19th century. 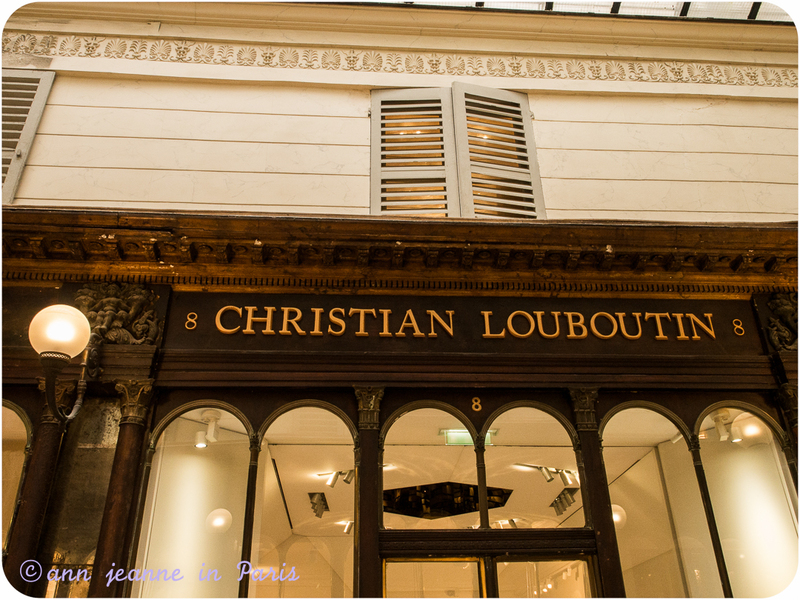 Many of the boutiques have kept their old-fashioned frontage. And their architecture is really beautiful : glass and metal doors. 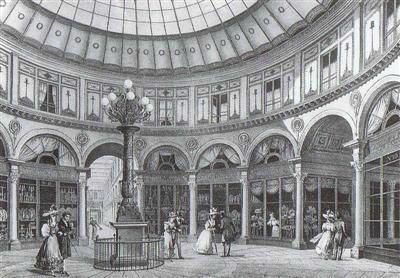 In the covered passages : marble paving, tile floors, glass roofs, hanging lamps, painted ceilings, copper pillars. 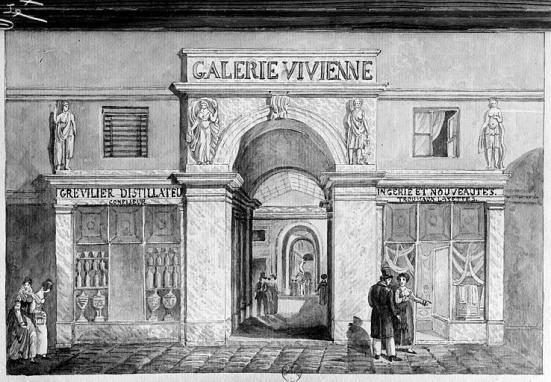 Many of the passages and the boutiques are listed on the Historic Monuments register (as above : a picture of a Luthier which has kept his original frontage). 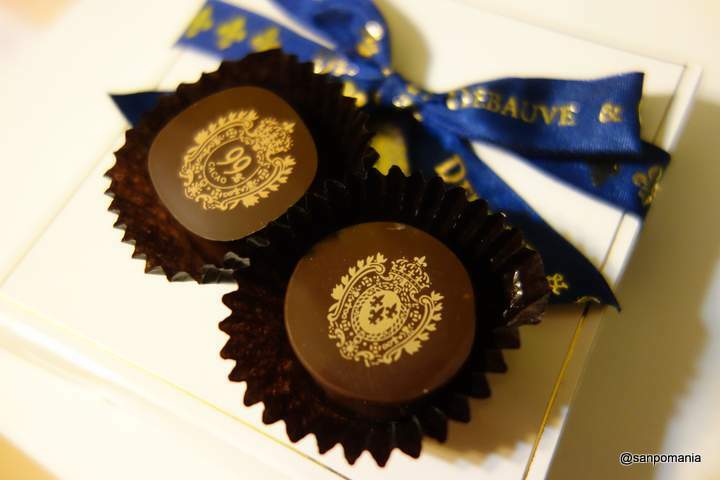 During your walking tour : why not some Marie Antoinette’s favorite chocolate ? 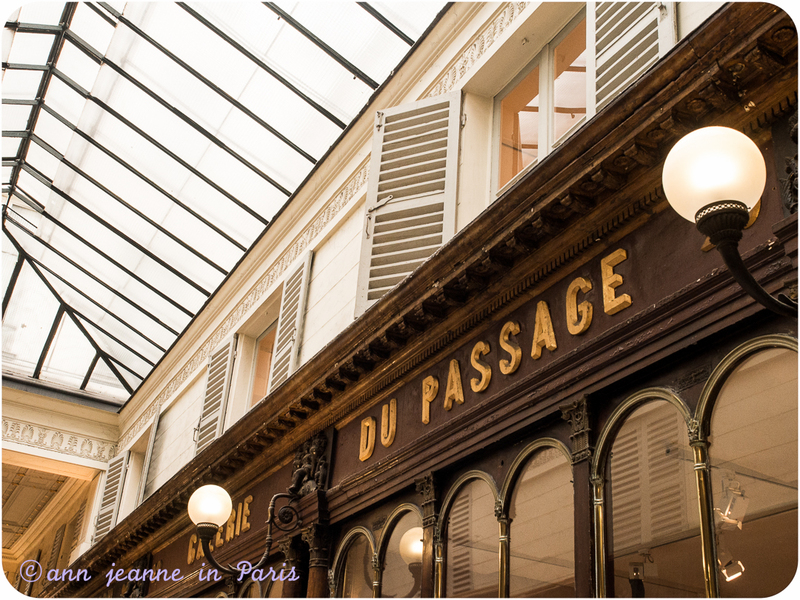 For a while, we’ll step back in the 18th century, with Marie-Antoinette’s favorite chocolate in a very old shop And in the whole day tour option : we’ll visit a wonderful confectionery in an old traditional shop first opened in 1762. 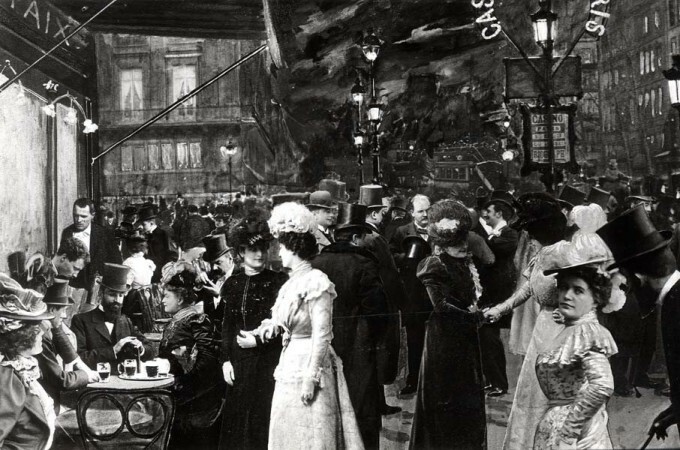 During the 19th century, the whole of Paris, used to meet in cafes. It was the place where were you could see all the famous and fashionable people. 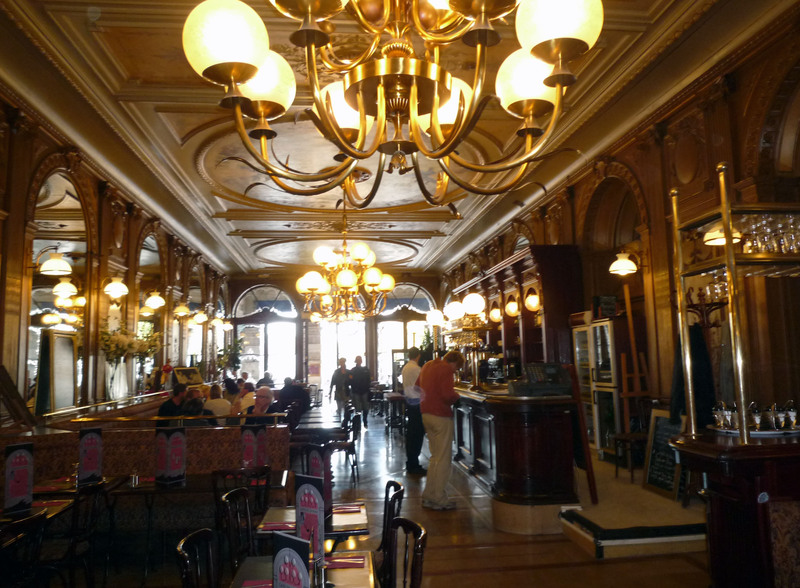 Many iconic cafes were located at the Grands Boulevards, such as Le Café de La Paix or Tortini (more details on the left and below). 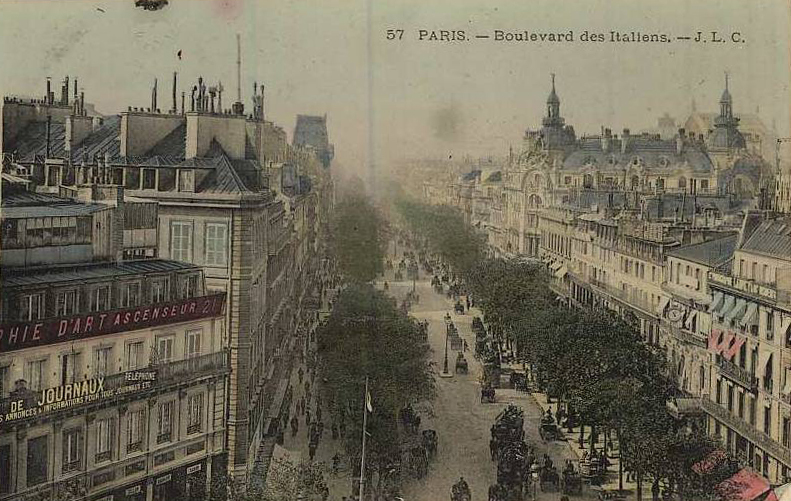 After the renovation by Baron Haussmann (since 1870) the Grand Boulevards were no longer the meeting centre of the elite, as much as they were before. 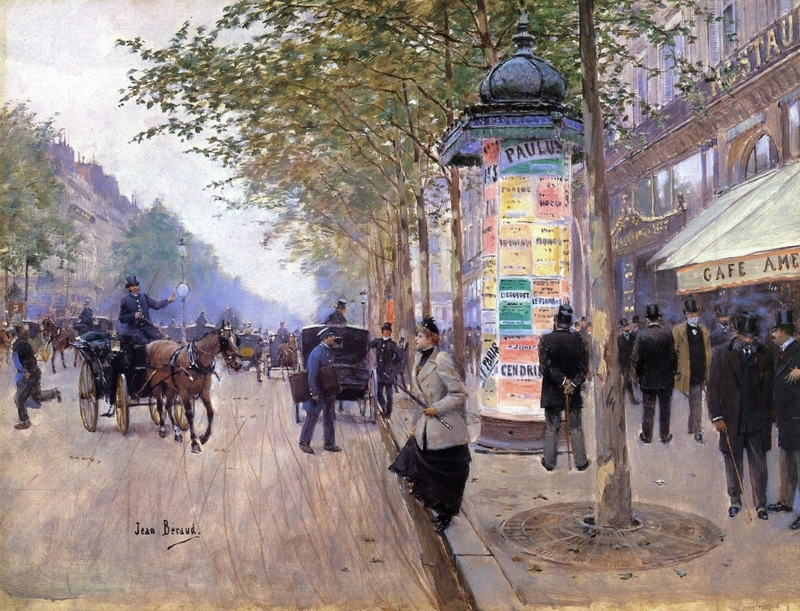 During the next decade, the fashionable places were for example : the Champs Elysées and the Place du Chatelet. 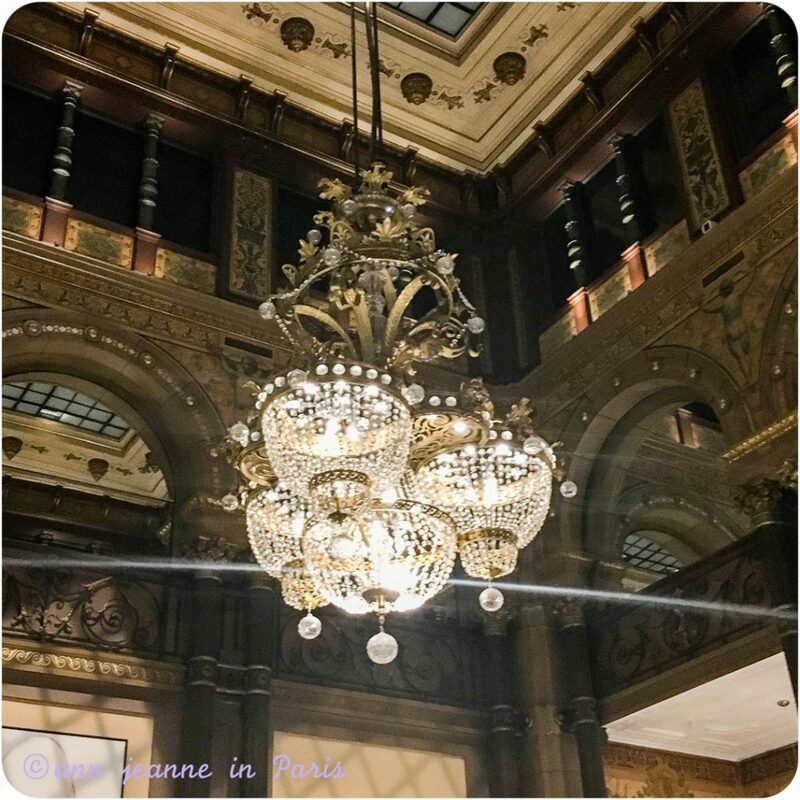 It is located on the ground floor of the Le Grand Hotel Intercontinental, nearby the Opera Garnier. 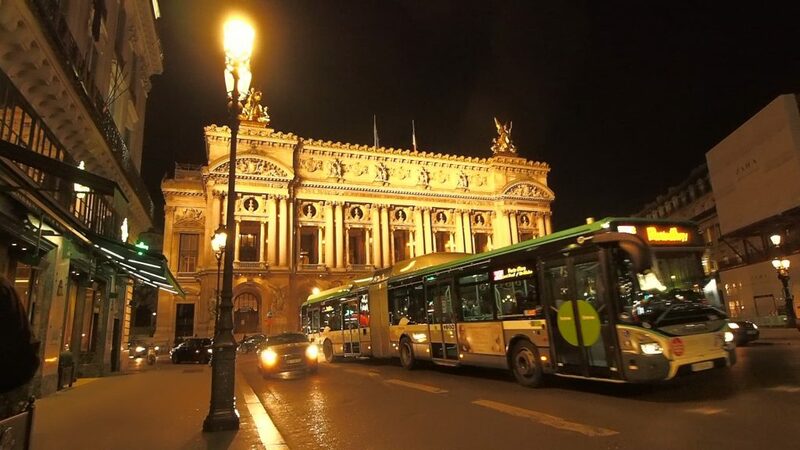 The entire block was designed by Charles Garnier, the architect of the Opera Garnier. 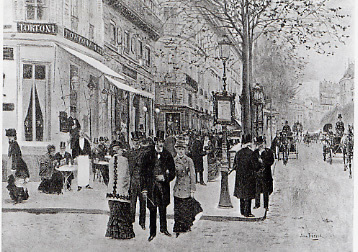 The café and the hotel opened in 1862. It’s decorated in the style of the Second Empire. 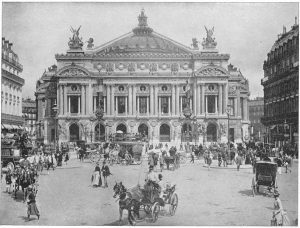 The proximity to the Opera brought figures such as Oscar Wilde (1898), Josephine Baker, Emile Zola, Guy de Maupassant or Ernest Hemigway. Frédéric Auguste Baratholdi produced here parts of the sketches of the Liberty Statue. 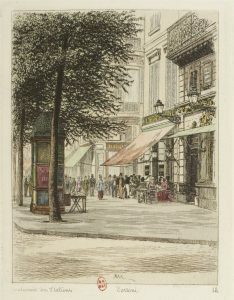 After the opening of the Paris Opera in 1876, the Café de la Paix immediately became the place for influential political men to meet, as well as those from the finance world and from abroad. 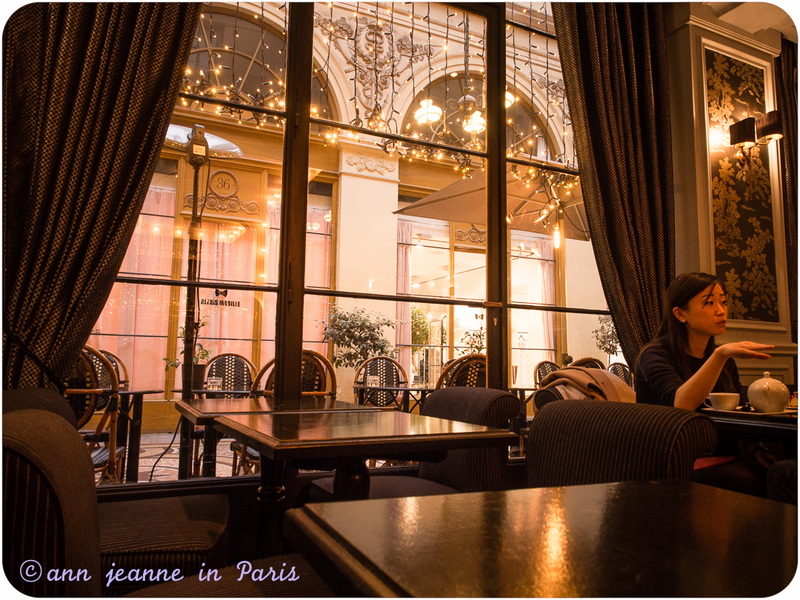 The Café de la Paix is still one of Paris’ most famous cafe. 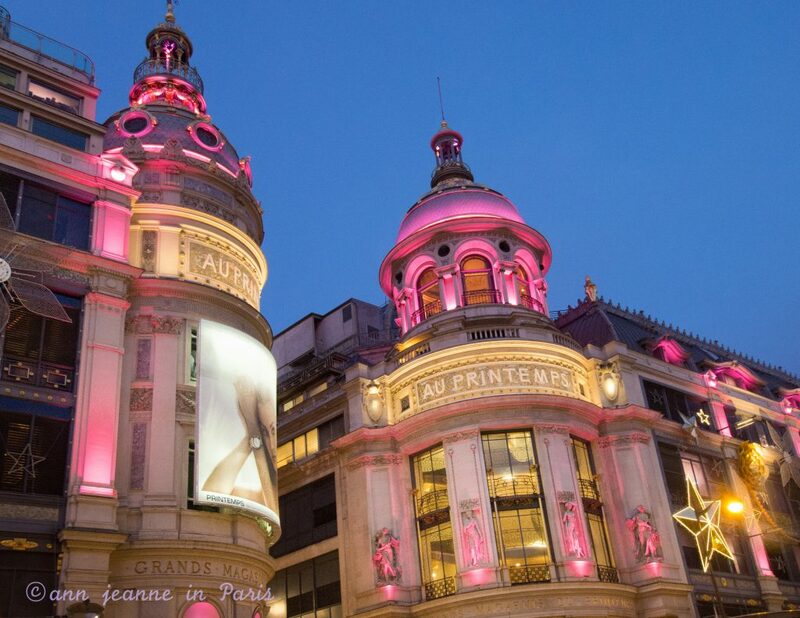 It was designed by the Charles Garnier, the architect of the Opéra Garnier . The décor recalls a past era and the elegance of the 19th century remains. During our walking tour, we’ll see how to recognize an Hausmannian building and what their specificities are. 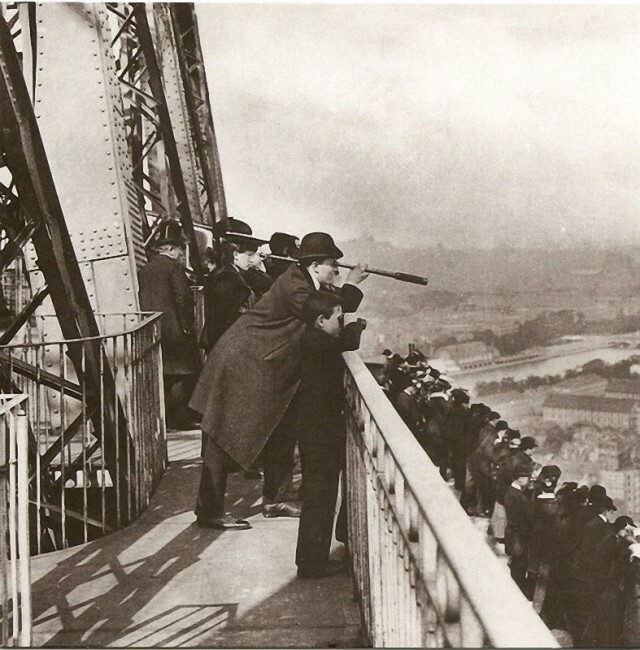 On our way, we’ll observe and find out what changes were achieved during the 19th century. 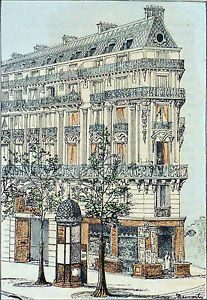 During the 19th century and the second Empire, Napoleon III and his prefect Haussmann, decided a very important urban renovation of the city, which made the Paris that we all know now. 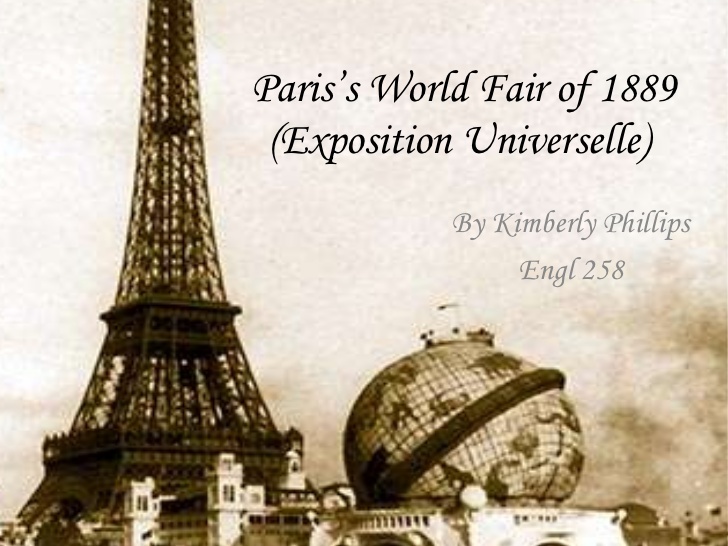 The city of Paris was rebuilt and modernized : the Opera Garnier, the Eiffel Tower, the Alexander bridge, the Grand Palais and the Petit Palais, the Metro… were built. 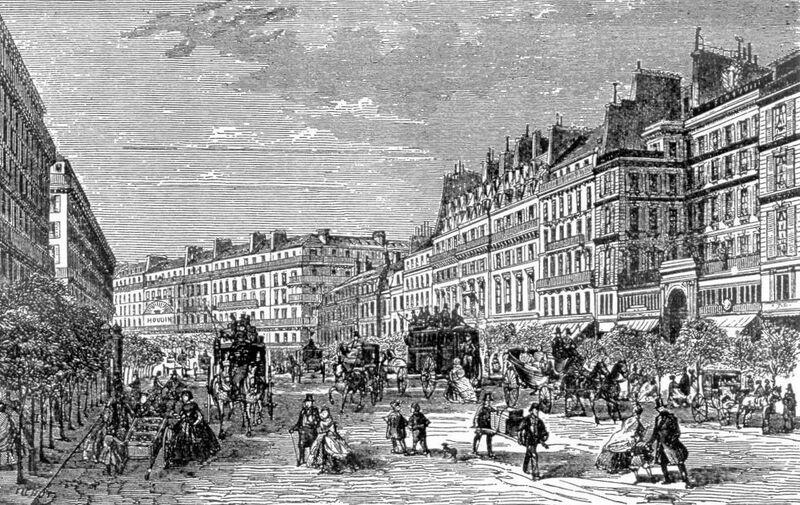 London inspired Napoleon III to change Paris’s urban landscape. In 1850, most streets were very narrow, often unsanitary and not efficient for commerce and traffic. 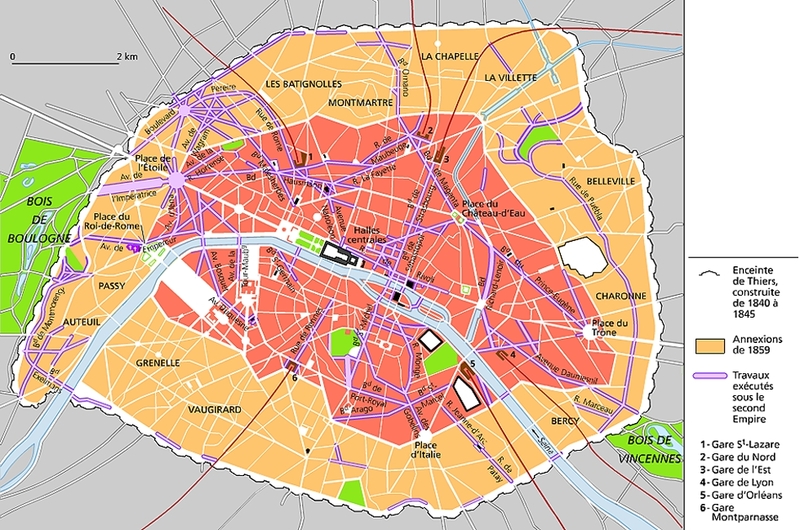 Napoleon wanted to change the medieval city of Paris into a modern capital with wide streets able to accomodate new modes of transportation, large parks and updated sewage systems. 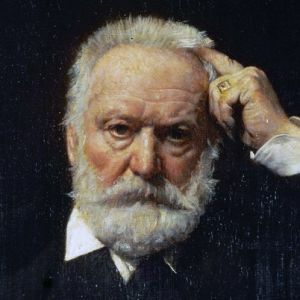 The Emperor gave Haussmann, the Prefect of the Seine, the power to achieve these transformations. He planned a uniform and harmonious cityscape. Entire neighborhoods were raized. Large straight avenues, edged with trees, here green areas and stone buildings were created. He required that the buildings obey some rigid architectural codes (the height, the number of floors, the construction materials to use, decorative details…), in order to creat a sort of unity and harmony. His work decisively has determined the current appearance of Paris. 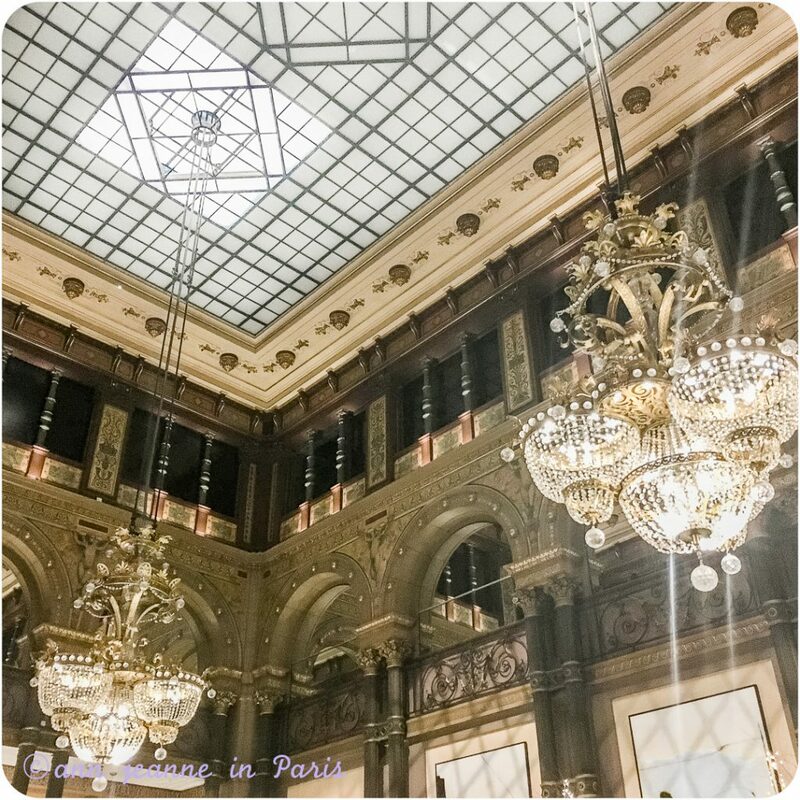 When you choose the whole day option, we visit the Printemps (created in 1865) or the Galeries Lafayette (opened in 1912) and see their art nouveau dome. 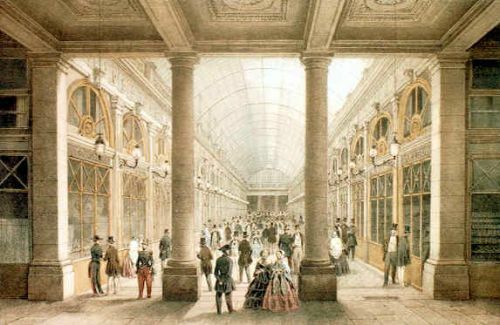 First opened in 1875 (Napoleon III – Second Empire) . A Neo-Baroque facade and a luxurious interior. For Ballets. 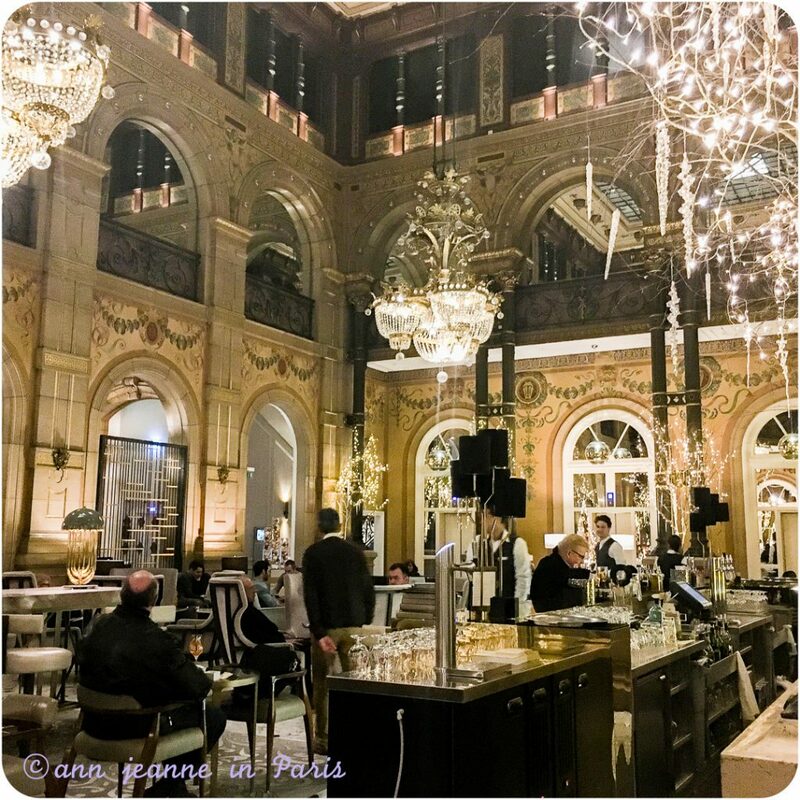 An amazing tour that will take you to some of the nicest covered galeries with old traditional and high range shops, marvellous tearooms and cafés. 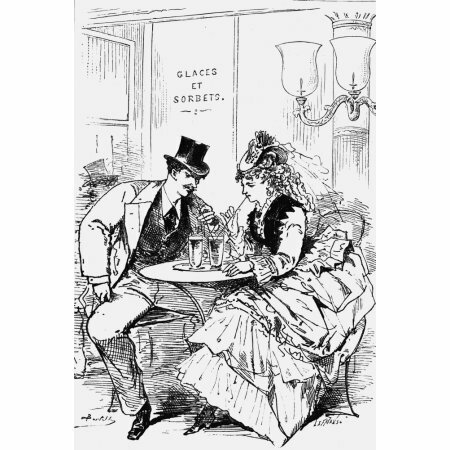 You’ll have the opportunity to get or taste some 19th century candies and/or chocolate (if you feel like it !). 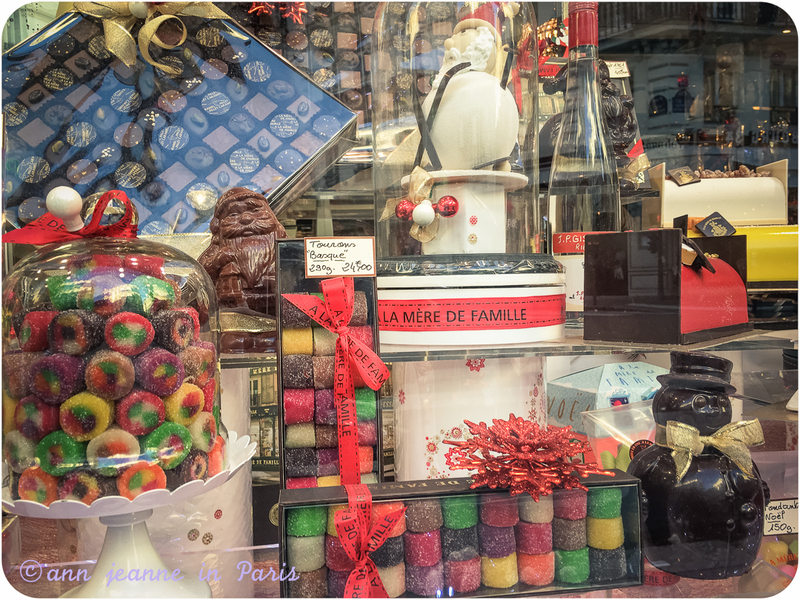 Why not Marie-Antoinette’s favorite chocolates… ? It includes a break in a café or a tearoom too. 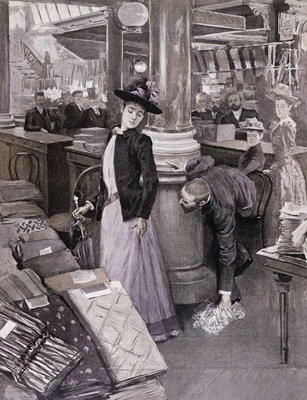 And above all, it will take you back in the Paris of the 19th century. 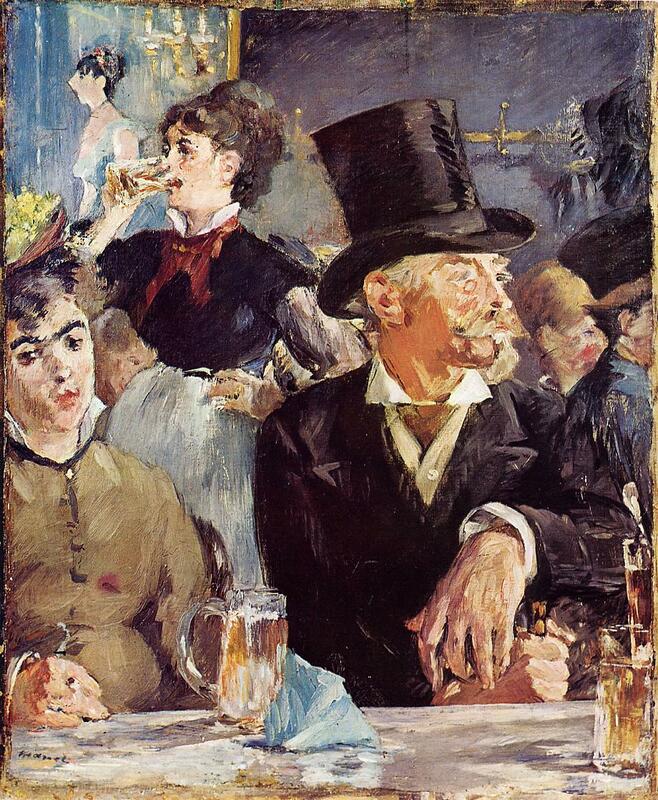 2 options : a half day tour or a whole day tour for a even larger exploration of Paris of the 19th century. Book your tour ! 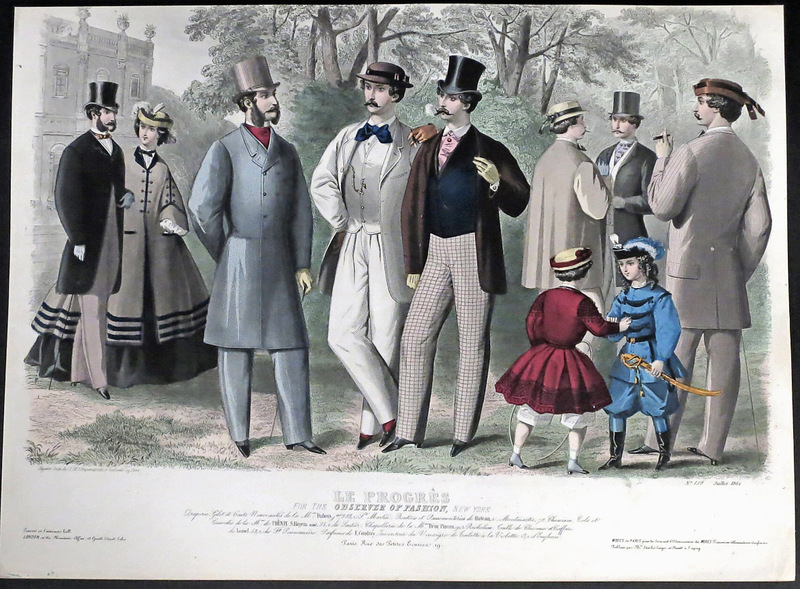 And now, MORE PHOTOS AND ILLUSTRATIONS... to let you soak up the 19th century atmosphere !